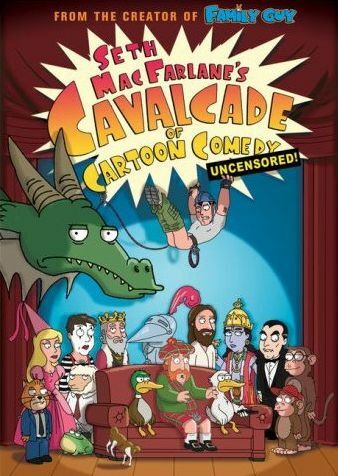 I typically like Seth MacFarlane's brand of humor, being a fan of both Family Guy and American Dad , so I was psyched to learn about this DVD, Seth MacFarlane's Cavalcade of Cartoon Comedy , even though I really wasn't sure what it was all about. Turns out, it's just a bunch cartoon shorts that have nothing to do with each other, like those cutaway jokes in Family Guy. Now, some of them were just hilarious, and a few fell way short of being funny, but on the whole they were entertaining. And that's kind of the problem, seeing as how there's no story, no plot, not characters to develop, and the whole thing lasts just over 50 minutes. One of the nice things about this DVD is that it is uncensored, so they can not only do all the swearing without those annoyying bleeps, but they can also do a lot more really gross gags that would never be able to make it onto television. One of my favorites, however, is the Scottsman that yells at the TV, which isn't gross at all, it's just funny what he says and how he says it in that accent. As for extra features, the disc is serious lacking. There's a four minute long Red Carpet Premiere, which is about as entertaining as it sounds, and then there is a photo gallery. So... yeah. I'd say it's worth renting if you have Netflix, or if it doesn't cost more than a couple bucks to rent, but I wouldn't recommending buying this.